Here at Atlantic Shopping, the fact that we supply such a huge range of bar stools means that they are consequently accompanied by a wide variety of different bar stool footrest designs. From subtle half-moon to more dramatic jaw drop footrests, there is something to suit all types of decors dependent on the statement you wish to make with your bar furniture. Often having a substantial impact on the overall appearance of the stool more generally, it is therefore essential that the shape of the footrest be considered when selecting the perfect stool for your home or business. However, it is also important to note that, although they do influence the look, the design of the footrest will not affect its functionality. This is because, with regards to adjusting height or rotating the seat of gas lift bar stools, the footrest will typically move as you move. In order to demonstrate the differences between each of the footrest designs we offer, a brief description of each is provided below. These include a photographic example and a link to a product that features the aforementioned style, enabling you to construct an informed preference on the footrest design that you will ultimately opt for. 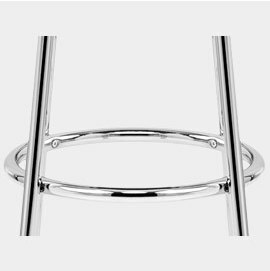 Due to their minimalist characteristics, half-moon shaped footrests are becoming an increasingly popular and widely available choice for bar stools of all price ranges. Composed of a smooth semi-circle shape that effortlessly curves at the front, they create the perfect perch for your legs when sat at height. Conveniently, their ability to move with you as you spin or adjust the height means they adapt to the needs of the person seated. In addition, as exemplified in the smooth, curved seat of the Mars Bar Stool, their design can often mirror that of the seat itself to provide a feeling of efficient and stylish consistency. A modern take on the traditional, our wide variety of half-moon styles makes it easy to find a complementing seat design that meets your requirements. Round footrests provide bar stools with both a distinctively attractive feature and constant stability when seated at all angles. 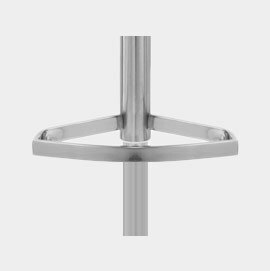 Encircling around the stem, the vast majority of those used on our gas lift stool designs also conveniently move with your body as the seat itself rotates, meaning smooth transition and increased support. This includes the Mint Bar Stool, whose minimalist design is also highlighted by the use of a round design that echoes the shape of its eye-catching circular base. In addition, a number of bar tables utilise round footrests to provide effective stability when sat at a height around them. Therefore, irrespective of your tastes, or the decor used, the choice of a round design will always give a stylish boost to your bar furniture. Designed with both modern style and practicality in mind, rectangular bar stool footrests are a fashionable choice that will provide a smooth shape and simplistic appeal to your bar area. Frequently being utilised on more of our deluxe designs, their crisp lines often echo those used on the stool's rectangular or square seat pads, giving a clean and coherent appearance from all perspectives. Additionally, by connecting to the stem, their shape also provides stability and effective foot support that moves with the seated person as they choose to rotate or adjust the height. Exemplified in stools like the stunning Lush Bar Stool, there is bound to be a rectangular footrest design that will add a touch of class to any room. Triangular footrests are a unique addition to any bar stool design. Comfortable for your feet whilst providing a stylised focal point, the triangular shape is a fashionable feature found on a great deal of our deluxe designs. Connected to the stem by two, thick diagonal bars, the horizontal front rest is typically flat giving maximum comfort whilst seated and secure stability at all angles as the it moves with you as you swivel upon the seat. The Mimi Real Leather Bar Stool typifies the allure of a triangular style and highlights the eye-catching effect this simple piece of metalwork can have on the look of the stool as a whole. 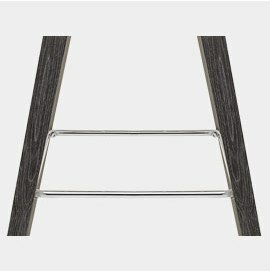 A striking alternative to more common shapes, T-Bar footrests are composed of a single, vertical bar emerging from the stem that then connects to a horizontal bar where the feet are placed. 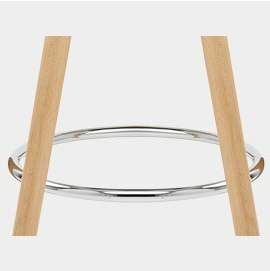 As the name suggests, this forms a distinctive 'T' shape which provides adequate support and a unique look to the metalwork of your bar stool. The open design of the rest's sides allow you to place and remove feet with added ease, and the fact that the rest also swivels with your body as the seat rotates means constant stability whilst seated. 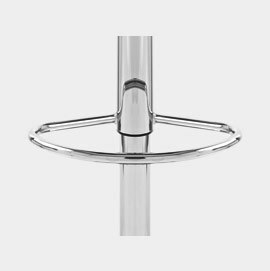 Employing a T-Bar support, the subtle seat design of the sumptuous Style Bar Stool is consequently given a sophisticated boost that still remains minimalist. 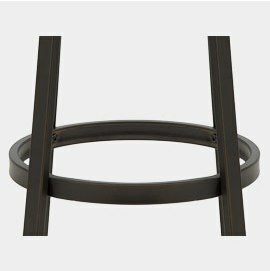 Possessing the same characteristics as T-Bar footrests, curved T-Bars similarly consist of a single metal bar connected to a horizontal foot bar. However, as the name suggests, this bar is in fact lightly curved rather than straight to give an additional, aesthetic effect. 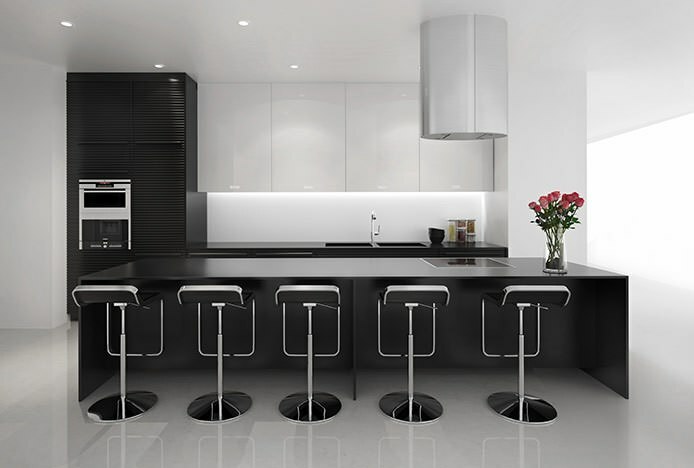 This curved bar is often used to correlate with the curved lines of the stool's seat design, as seen in the striking Gloss Coco Bar Stools (pictured above), which have a futuristic appearance that a curved footrest compliments. 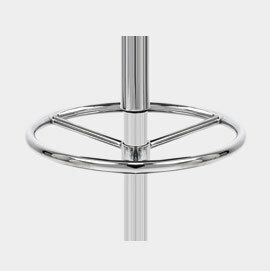 Increasingly being used in designs across our range, curved T-Bars combine style and stability to form the perfect perch for any modern stool design. Certain to make your own jaw drop, bar stools that feature the aptly titled jaw drop footrests often employ them as the principal feature. Evidently, this is because they are such an integral and striking part of the overall design. 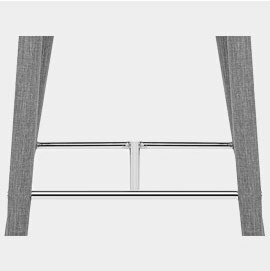 Formed of metal bars cascading from either side of the seat pad, they then meet a horizontal bar to form a fashionable footrest. Our popular Niagara Bar Stool exemplifies a jaw drop design, and has the additional feature of a protective pad on the rest for durability. Also referred to as a 'waterfall' style rest, it gives the appearance of a effortlessly flowing waterfall, whilst it's attachment to the seat design itself means that the rest conveniently follows you as you rotate the seat or adjust the stool's height, resulting in sufficient stability from all directions. Our four legged stools also have a variety of different footrest designs, with many making a fashionable feature of the frame. Unlike gas lift designs, the footrest does not move with you as it is fixed in place at an ideal height for your feet when sat at the bar area. The different types we use are outlined below with examples for each style. The bracing bar footrest is the most popular for fixed height stools and is used in a variety of our four-legged models. 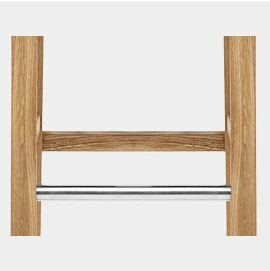 It is part of a set of bars within the frame that work to strengthen the stool. This usually consists of individual bars connecting the legs, as seen in the Ascot. 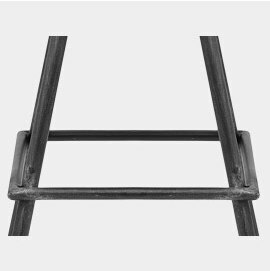 In other designs, like the Blush and Vintage Tractor Stool, a continuous welded bracing bar is used and this sits inside or outside of the legs. 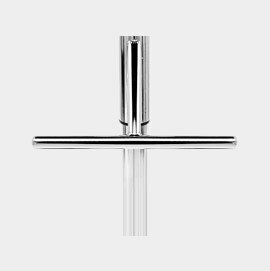 The bars are usually crafted from the same material as the frame, keeping a consistent and harmonious appearance. 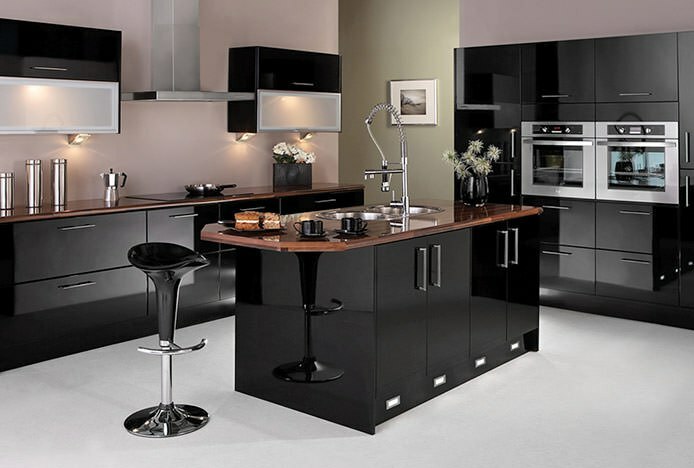 We do have some products where a contrasting material is used, as we explain below. 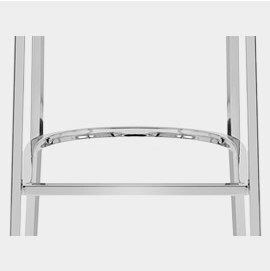 Bringing modern detail to many of our wooden stools, a contrasting chrome footrest becomes a feature focal point rather than just a functional addition. Not only does this add style to a wooden frame, a metal support is also more durable and easy to wipe clean. 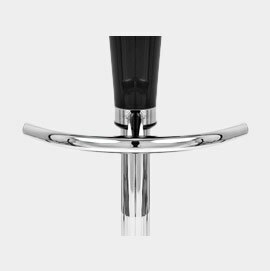 There are many different types with some, such as the Grasmere Oak Bar Stool, showcasing a single tubular bar, whilst others have an eye-catching H-bar design that also reinforces the four legs, as seen in the Morgan. 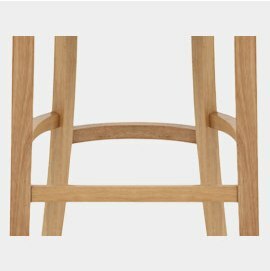 This style is also achieved with a continuous square bracing bar, demonstrated beautifully by the Henley Wooden Stool. A striking addition to many of our funky and modern models, a circular footrest is also practical, providing a comfortable perch at every angle on our backless and swivel designs. 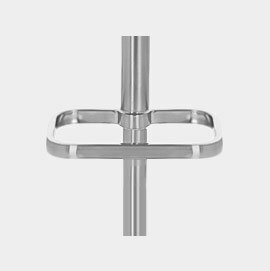 The ring usually sits within the four legs of the frame, delivering strength and style. Often used in chrome on a wooden stool, like the Jive Wooden Stool, it can create a cool contrast. Or, in designs like the Industrial Turner Stool, the frame is crafted from the same material and the circular footrest shape mirrors the round seat. 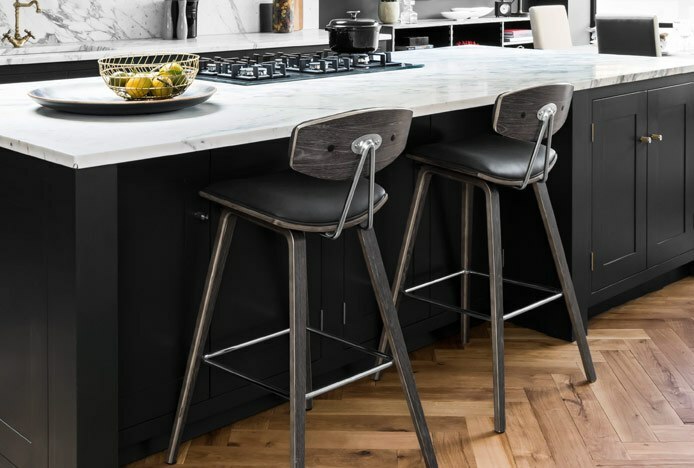 Whether you’re after a striking design with a jaw drop footrest, or a minimalist model with a half-moon style support, we’ve got the bar stool for you at Atlantic Shopping. Why not take a look at our great range of bar stools to get started. Legs or a column & base? We help you find the right style stool for you..